OK so who doesn’t love chicken fingers? It’s just one of those things that literally everyone (with the exception of poor, poor people with allergies) will eat. Doesn’t matter if you’re 4 or 94, chicken fingers are always good. In fact, when my roommates and I got our first apartment while in college at Auburn, our very first meal there, christening the kitchen, was actually…frozen chicken fingers…in the shape of dinosaurs (with a side of mac n cheese). Because college kids are still just kids. Well, I have graduated from the frozen, dinosaur shaped chicken fingers to a homemade, more grownup, healthier version. (Though if I could’ve shaped them into dinosaurs, I would have.) 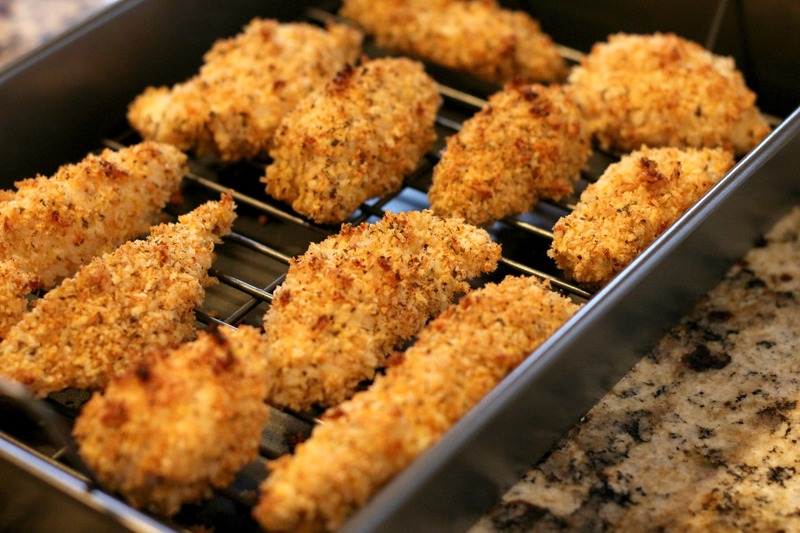 Chicken fingers are one of the few frozen food items that you can actually make yourself without a whole lot of time or know-how. In other words, it’s a pretty simple method to enjoy this classic food without all the processed nastiness in the frozen product. These turned out nice and crunchy, and I really liked the seasoning. It definitely provided a much stronger flavor (but not too strong) so that these didn’t even need any condiments for dipping. My biggest complaint is that the bottoms get soggy. I’ve made several breaded dishes like this before and the bottoms ALWAYS get soggy. This time, I tried putting the strips on an elevated rack (as you can see in the picture) hoping that would solve the problem. But no, still soggy. If you know how to get the bottoms to be crispy like the top, please let me know! Combine egg substitute, mustard, & garlic in a shallow bowl. In another bowl, panko crumbs & remaining seasonings. Dip chicken into egg mix and then in crumbs. I really love your homemade chicken fingers. As obsessed with ketchup that I am, I didn’t even need to use any. Can’t wait to have these again! cook them on the rack but flip them over halfway thru cooking. Good idea Angie! I’ll try that next time. could not print – you need to put a printer version on site thank you. Diana, all of my more recent posts have a printer-friendly link, but many of the older ones (like this one) do not. However, due to your comment, I’ve gone back and added one to this post just for you! The link is located just above the actual recipe.